Green factor: Recycling available. Styrofoam containers and plastic utensils. 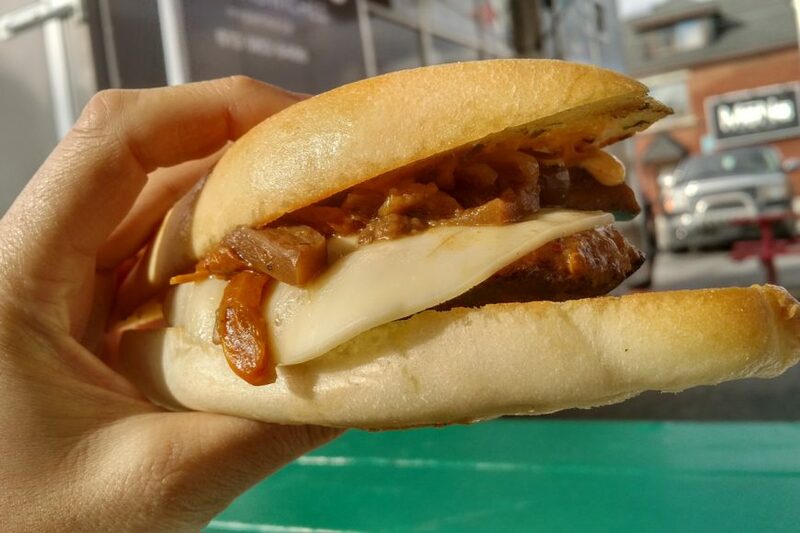 When it comes to food trucks, there’s varying degrees of how easy it is to discover them. 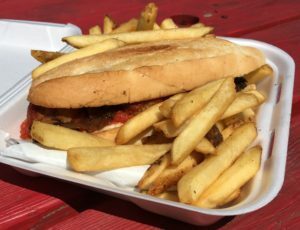 Some have an active presence across all the big social media platforms, plus up-to-date schedules on the Street Food App, and then there’s the old-school chip wagons which you only know about if you walk past them. The recently opened Mr. Panino sits somewhere in the middle, with moderately active Insta and FB accounts, but no Street Food App presence for easy tracking of their hours/location. In the hopes that they were open, I crossed my fingers and made my way over to Preston and Louisa around noon on a weekday. 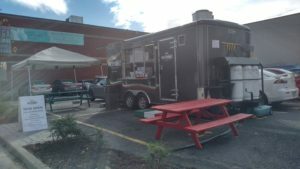 The unassuming black trailer is painted with some Italian flags, but is otherwise pretty minimalist compared to many other, more brightly-coloured mobile food-slingers. Their menu is as you would expect for a place called Mr. Panino (“little bread”), with several Italian-style sandwiches, including veal and chicken parm, meatball, cold cuts, as well as soups and salads. Being Ottawa, you can still get your French fry and poutine fix here too. 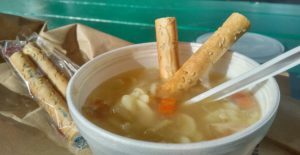 I was enticed by the spicy sausage sandwich, and the cool fall air pushed me toward their soup of the day, chicken rotini. After a short wait, a friendly smile from the staff and the exchange of cash ($11.50 total), I had my food in hand and set up shop at one of their picnic tables. After cracking my container of soup open to let it cool off a bit, I then dug in to my sandwich. It wasn’t a typical North American panini, with bread grilled in a sandwich press, but rather a literal small sandwich. Well, “small” compared to the likes of a large hero or sub, but much bigger than the likes of a slider. Really, it’s a good size for a lunch if paired with soup or a salad. The bread had a crisp exterior and enough heft to stand up to its fillings, without being too chewy. 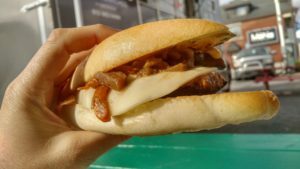 The sausage patty was house-made, tender and juicy, and much larger than those found in fast food breakfast sandwiches. While I was warned of its spice levels, I found it to be a pleasant amount of heat, although I have a decent spice tolerance. 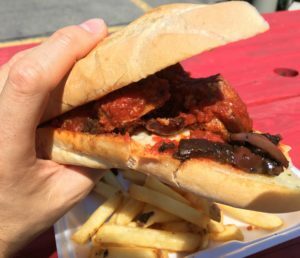 Topped with their marinara sauce, sautéed onions, and eggplant, it was a hearty sandwich that made for a nice lunch on a sunny but cool fall day. While not on the cutting edge of modern food, the chicken rotini soup was a simple, down-home style soup. Chunks of roasted chicken (notably not pre-cut cubes from a freezer bag) lounged in the flavourful sort of broth that we all crave whenever we get a cold, while the rest of the soup was fleshed out with large spirals of rotini, carrots and onion. Packets of breadsticks were supplied instead of saltines, and I preferred their sturdier constitution. On a second visit this summer, I tried out their meatball sandwich, and tacked on an order of fries and a pickle, and a bottle of water ($16 total). This sandwich had the same bread as my previous visit, and was just as good this time around. The meatballs were meaty and lightly seasoned, and I appreciated that their soft texture made them easy to bite through in a sandwich. The marinara sauce was bright and tomato-y, and mixed sautéed veggies added some depth. Some provolone added the salty goodness that is melted cheese. The fries were a little too perfectly shaped and light in colour for me to think that they’re hand-cut, but these skin-on freezer fries were crispy on the outside, and fluffy on the inside, and that’s all you really need. There’s nothing wrong with doing simple things well – quite the opposite in fact – and I look forward to getting a big belly from Mr. Panino’s little sandwiches. “Cool fall air?” What are you talking about? it’s mid-August and the temperature’s been summer-like since May. My first visit was last fall, the second this summer.